After tasting the Sauvignon Blancs, I also had the opportunity to taste three of their Pinot Noirs. Interestingly enough, Fiddlehead produces a number of bottlings from both their Santa Rita Hills estate vineyard, Fiddlestix, as well as fruit from specific custom-farmed blocks in Oregon’s Willamette Valley. The Fiddlehead Oldsville Reserve 2006, while still the slightest bit hot, possessed an excellent balance between ripe dark cherries, flowers, licorice, and an earthier funkiness that was just intriguing. There was an addictive glycerin texture to the mid-palate, too, that will make it awfully difficult to lay a couple of bottles of this one down and not pillage them immediately. But some time in the cellar will definitely reward patience, and I expect that, once it sheds some of its youthful exuberance, this wine will evolve into one heck of a bottle of Willamette Pinot. Heading south to California, the two wines produced from Fiddlehead’s estate vineyard were equally delicious yet in totally different ways. 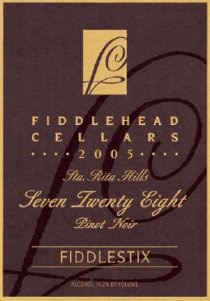 The Fiddlestix “Seven Twenty Eight” 2005 was, simply, darn good. It earthy nose led to a palate bursting with rich cherries, ripe berries, minerals, morels, violets and lavender. The combination of youthful power and dangerously easy gulpability was a result of both its beautifully integrated tannins and exquisitely balanced acidity in addition to the deep well of flavors it revealed with every sip. The finish—a long, graceful interplay of blackberries and black raspberries—was yet one more grace note in this stellar wine that should continue to evolve for another 3 – 7 years. The barrel selection for the Fiddlestix “Lollapalooza” 2005, on the other hand—only 180 cases were produced, as opposed to 2,200 of the “Seven Twenty Eight”—resulted in a wine that was more elegant but just as deeply flavored. Pretty aromas of flowers and lavender wafted up from the glass, and well-concentrated dark berries left their imprint on the palate. This is a young wine that still needs time to absorb its oak and come into its own. Once it gets there, though, I expect it to be a standout—a rich, perfumed, ever-so-subtly spicy testament to the potential of this great vineyard. It’s fantastic now, but a couple of years should really give it a chance to shine even more brightly.